Wow, there's not been a season thread since Filipe Reis did it, but hey, someone has to. So, as you all know the 2017-18 season was a trainwreck of massive proportions as a promising Sporting slowly but surely self-destructed. It all culminated with the attack at Alcochete which saw a star exodus and Bruno de Carvalho was voted out of power as Jorge Jesus left for Al-Hilal. And this is what we're left with after José Peseiro was brought back in and Frederico Varandas won a close election, it was never going to be easy, it will be a trial of fire for Sporting this season. Can they recover or has the Lion stopped kicking? Not so quick rundown, Viviano got injured before Sporting vs Moreirense so Salin took his place as Sporting came from 1-0 down to win 3-1 with a Bas Dost brace and a Bruno Fernandes goal. Nani shined brightest against Vitoria de Setúbal and scored a penalty against Benfica to give Sporting the lead as Salin was having the game of his life, however Benfica's equaliser was inevitable. Sporting beat Feirense 1-0 with a late goal by Jovane Cabral before the international break. Sporting came back strongly with a 3-1 win against Marítimo in the League Cup and a 2-0 win against Qarabag in the Europa League. However the first moment of panic and cynicism came as Braga beat Sporting 1-0 in the Liga NOS, putting Sporting down to 5th as they got their first defeat of the season. And that's where we stand, Sporting will take on Marítimo at 21:00 WEST, but this time for the league, Sporting need a win to atleast get 4th before Sporting goes to Ukraine to play Vorskla in the Europa League. Some recent news about Sporting vs Marítimo, Nani has not been called up for the match against Marítimo due to having a spat with Peseiro in an incident reminiscent of the time Peseiro subbed off Rochemback and he told Peseiro what he thought. Sporting won easily against Marítimo with a penalty as Rafinha was brought down and Bruno Fernandes converted, Fredy Montero doubled the lead after tapping it in following a scramble in the box. Our next match is against Vorskla in the Europa League, let's do this. Last edited by TheAmessz; September 29th, 2018 at 23:16. Sporting takes on Vorskla at 17:55 today, let’s get some more crucial 3 points, Nani is back in the team but Viviano and Bas Dost are still out to injury. I hope that Viviano stays out really, we basically bought the new Roberto for €1.8 million. Sporting looked like they had lost the theoretical easiest match of the group stage as Vorskla had braved through the 7 degree celcius weather to put one past Salin. Sporting played horribly as Vorskla seemed to just cut out anything that we tried to string together, but late on the magic finally happened as Montero scored after cutting in, and then Jovanne Cabral stole the headlines with a goal with only 2 minutes left on the clock, it wasn't our best showing for 89 minutes but all we needed was 3 minutes out of 95. There's nothing to say, we are back to the crisis. The only thing that deserves to be talked about here is Salin, he had a nasty collision with the post and had Coates prevent him from swallowing his tongue, but he recovered quickly in the hospital. Last edited by TheAmessz; October 21st, 2018 at 18:50. Sporting were uninspiring against Loures, with plenty of missed chances from either side, including a penalty from Bruno Fernandes that got saved by Miguel Soares, who had gotten a hand to his 42nd minute goal. Sporting are through, but they were very underwhelming. Sporting takes on Arsenal next in the Europa League at Alvalade, both teams are looking forward to taking 1st place in the group, and this match and the away match will decide that. SPORTING: Renan Ribeiro; Ristovski, Coates, André Pinto and Acuña; Battaglia, Petrovic and Gudelj; Nani, Bruno Fernandes and Montero. A bad second half, bad refereeing and bad football doomed a hard-working (for 60 minutes that is) Sporting to their 3rd defeat in all competitions as the run of dire results continues, Sporting this match were the epitome of everything that happened at the end of the last season until now, we are not the same Sporting that we were at the start of 2018, our heart and soul has been ripped from us to the point that we played like Benfica with the diving and timewasting, we didn't even get a shot on target. Much like in the Atletico Madrid 2-0 defeat, they got a goal from a Coates defensive mistake, it's just always him isn't it? Honestly who even knows what's gonna happen next, it's the same old story for Sporting but it feels new, i just want this season to be over to be quite honest. Finally, a good performance! The match was very lively with both chances, Boavista even having a shot that hit the post, but Nani eventually put us in front with a header which the goalkeeper got a hand to it but unfortunately for him it hit the post and went in. The win was sealed with 2 goals in 2 minutes from Bruno Fernandes and Nani, giving us our biggest win of the season and our 4th clean sheet of the season, putting us 2 points behind the league leaders but yet still in 5th. And of course, Bas Dost returned to the field after 2 months out injured and got an almighty reception from the near-packed stadium, and the team, already 3 goals up, desperately tried to get Bas Dost the emotional goal he deserved, but despite an off-target header he just couldn't get the goal. Oh well, he'll be back against Estoril this Wednesday. In an underwhelming night, Sporting's Taça da Liga hopes took a battering after a late collapse was capped off by an own goal. Sporting actually started the first half well, Wendel scored early after Bas Dost stole the ball for him, and when it looked likely that Sporting might get their second the steam had run out as in the second half Estoril took charge, and after much knocking on the door they finally equalised after Sandro Lima sent André Pinto down to the floor as he outskilled him and put it past Salin, and it wouldn't end there for André Pinto as he headed it into his own goal in the 82nd minute. Thierry's double save near the end meant that Sporting would not get the vital equaliser, losing the match. Sporting now need to beat Feirense by 2 goals and hope that eliminated Marítimo do us a favour by beating or drawing against Estoril, who could leapfrog us if we fail to win, the tides are up against us as we look to have the worst title defence since Vitória de Setúbal got last place in their group, having won the year before. José Peseiro was fired after much protesting and doubts about his ability from Sportinguistas, this had been the straw that broke the camel's back after a L-W-L-W-L pattern since the loss to Portimoense, now Sporting will try to find a manager as Tiago Fernandes takes over as a caretaker. SPORTING: Renan; Bruno Gaspar, Coates, Mathieu and Lumor; Battaglia and Acuña; Nani, Bruno Fernandes and Diaby; Bas Dost. November started off with a hard fought win lead by interim manager Tiago Fernandes against Santa Clara in a very controversial and feisty match as there were 18 fouls in total from both teams. Following a back-and-forth between Mamadu and Nani, Battaglia was injured and eventually lead to Zé Manuel's goal as he was not marked, leaving him to do as he pleased to put the home side ahead. Sporting would go on to dominate the second half however as Santa Clara went defensive to try to secure the win, however after many protests about Bas Dost being brought down in the box, Bas Dost went on to equalise the match, even having to re-take the penalty as the referee did not blow the whistle. Acuña gave us the winning goal in the 75th minute, heading in a cross from Jovane Cabral as Sporting had done the best they could do against 10 men. And after holding on to dear life for the next 15 minutes, Sporting won 2-1 and put themselves only 2 points behind the leaders. Porto and Braga will face eachother next so that will be very decisive, but for now we will take on Arsenal this Thursday with our new manager, hopefully we could play as well as we did here. Last edited by TheAmessz; January 30th, 2019 at 18:48. Tiago Fernandes capped off his last match with a surprising but dull 0-0 draw as Arsenal are through and Sporting are only a draw away from making it to the Round of 32. As expected, Arsenal had the better chances but they were just not able to get the goal. Danny Welbeck got injured and Acuna got a yellow card, meaning that he would miss Sporting's next Europa League match against Qarabag, Mathieu also sacrificed himself, taking one for the team by getting red carded after fouling Aubameyang following a misguided pass back, just like in Madrid. It felt like a win for Sporting, who expected to get comfortably beat, but now we've got Marcel Keizer until 2021, so hopefully we don't regret not sticking with Tiago Fernandes, which, in just half a week, got Sporting playing great football. Last edited by TheAmessz; November 10th, 2018 at 13:04. 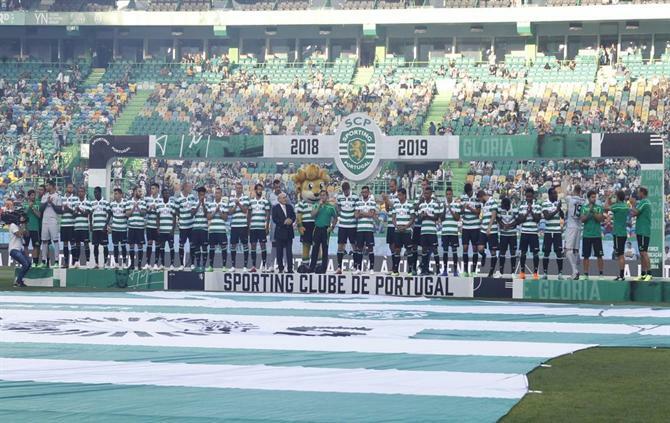 Armistice Day had certainly been an interesting day for Sporting, Bruno de Carvalho and the Juve Leo leader, Mustafa, had been detained for their involvement in the attack on Alcochete back in May, Keizer had arrived to Lisbon to be presented as Sporting's manager, however it would be Tiago Fernandes' farewell match after a successful spell as caretaker manager. The match was very calm before and since Bas Dost's opener in the 36th minute, however things started picking up steam after Bruno Gallo's red card in the 71st minute, 10 minutes later Chaves equalised with an absolute rocket into the top-left corner of the net, nothing that Renan could do. Sporting pushed on for the winning goal and it came from a Bas Dost penalty after he was pulled down in the box during a corner, Sporting are now 2nd by a point ahead of Braga and 2 behind Porto, can Marcel Keizer hold on to it at least? Honestly at half time it looked like the same, we were trying 1-1 with weak opposition, however Sporting kicked it up a notch in the second half as Bruno Fernandes, Diaby and Bas Dost added to the tally, ensuring our safe passage to the next round. Finally, we got the game we were waiting for, even if we were 1-1 like last time, we kicked it up yet another notch and put 6 past Qarabag, which we were only able to beat 2-0 last time, Nani and Bruno Fernandes both had cracking goals but Diaby scored for a second consecutive match and not only that, he got a brace, Keizer got the players to reject whatever the opposition throws at them and we finally played above the "Ok, you get a goal and then we park the bus" mentality we had for quite a long time. You already know the story, 1-1, kicking it up another notch, win the game, but atleast that shows that we got the ability to fight back, and obviously how could i forget to mention Jovane Cabral's goal, that was just sheer brilliance to seal the win. So, conclusion? Keizer's got us hoping again, and then again he got 13 goals in only 3 games and everything seems rosy, only problem is getting to 1-1, obviously if we can keep kicking it up another gear and winning the match that's no problem, but if we go up against a team that can defend a 1-1, we've got problems. Keizer will have his first home match against Aves, there he'll be hearing the noise of Alvalade as he continues his impossible job of making Sporting champions, not that it will happen for multiple reasons but 2nd will do. Sporting walked away with all 3 points despite being 1-0 down in a feisty late night at Alvalade, Marcel Keizer's lions did not look impressive as even Aves were dominating the game, scoring one and missing an open goal following a badly timed pass by Coates. Sporting were able to come back from 1-0 down to lead 2-1 following a wonderful hit by Nani right before half time, and in the second half Sporting didn't stop either, with Bas Dost getting a brace and Diaby hitting a 4th for Sporting being enough to see Sporting maintain 2nd despite a bad showing for the first 30 minutes. Sporting will take on Vorskla in the Europa League on Thursday, we are already through with a match to spare, so Keizer will most likely rest the big players before the match against Nacional da Madeira. At last, Sporting have shown some fighting spirit when faced with adversity for the first time in a long time, things did not start well when Nacional da Madeira took a 2 goal lead following a strike from outside the box and a close head header in which Mathieu and Renan could've done better, this had been the first time Keizer's men had been that far back, Bas Dost later had a disallowed goal which is still dubious but that wasn't all as Bas Dost got a goal back before half time via a penalty kick. In the second half, Sporting would have another dubious decision as Diaby was bodyslammed in the box, temporarily knocking him unconscious, the referee, after checking VAR, said that it was perfectly fine. The equaliser would finally come after a Bas Dost shot was fumbled, Bruno Fernandes was there to tap it in. Mathieu would redeem himself with a wonderful free kick that launched Sporting back in the lead and back to 2nd place, and then the goals flowed freely as Bas Dost scored another penalty and Bruno Fernandes got another one after hitting the rebound, Sporting had not only been 2-0 down, not only had they turned around but they made it look easy. I missed out on reporting the Vorskla match because i was busy at the time, however i did get to watch the match and it was a great exhibition by our youth, every substitution we did was the debut of a youth team player, one of them was Correia, part of the U19 team that won the Euro, Miguel Luis scored his first goal for Sporting and Fredy Montero was sidelined for a month, but atleast he got to score the opening goal, it was Keizer's smallest win, yes, a 3-0 win was his smallest win so far, but atleast we got the clean sheet. RIO AVE: Leonardo Jardim; Nadjack, Nelson Monte, Buatu and Matheus Reis; Jambor and Schmidt; Fábio Coentrão, Diego Lopes and Galeno; Gelson Dala. Another match at Alvalade, another 5-2 win, Sporting has reached 30 goals in 7 games since Keizer took charge, the first goal came from Diaby in just 3 minutes after a pass from Acuña, the second came after the 30 minute mark as Coates' header hit the post and was perfectly positioned for Bas Dost to get his first of the game, Bruno Fernandes made it 3-0 from a great strike, Bruno Gaspar would be the next to score, only problem was it was in his own goal after incredibly bad luck saw his interception hit the bar, the post and went in. Only 2 more matches left of 2018, a league match against Vitoria de Guimaraes and a do or die match against Feirense, we will need a win by 2 goals or more to see us through. Sporting's Christmas was ruined after a mediocre loss, Keizer's first, which was only reduced due to Renan's heroics even if he almost became the villain but had a red card nullified thanks to VAR. Following the loss Sporting went down to 3rd and have a 5 point gap on leaders Porto, if we don't beat them on the 12th of January, that's it. Sportinguistas were not allowed on the stadium until the 30th minute of the game, Vitoria de Guimarães took the lead in the 26th minute with a Mathieu deflection, eventually as Sporting couldn't grow back into the game that goal would be enough to end Keizer's honeymoon which saw Sporting score 30 goals in 7, now all we have to do is prevent a complete breakdown. Sporting has always conceded a goal since Keizer took charge and we seem to struggle away from home in the league, it was always gonna be hard against Vitoria de Guimarães as they are a very well composed team but it was still a bucket of ice to us as Keizer had made us so confident. Sporting plays against Feirense in the Taça da Liga, following our 2-1 loss with Estoril we now need to win by 2 goals to go through, this is Keizer's biggest test so far.